All the signs pointed towards Antigua. The island had warm, steady winds, a complex coastline of safe harbors, and a protective, nearly unbroken wall of coral reef. It would make a perfect place to hide a fleet. And so in 1784 the legendary Admiral Horatio Nelson sailed to Antigua and established Great Britain's most important Caribbean base. Little did he know that over 200 years later the same unique characteristics that attracted the Royal Navy would transform Antigua and Barbuda in one of the Caribbean's premier tourist destinations. 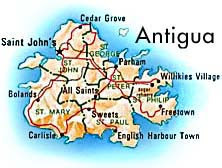 Antigua (pronounced An-tee'ga) and Barbuda are located in the middle of the Leeward Islands in the Eastern Caribbean, roughly 17 degrees north of the equator. To the south are the islands of Montserrat and Guadaloupe, and to the north and west are Nevis, St. Kitts, St. Barts, and St. Martin. Barbuda is one of those very few islands in the Caribbean that remains--and probably will remain for some time--so undeveloped as to seem positively deserted at times. With the exception of the guests of the island's small number of accommodations, the population seems largely to consist of the graceful Fregatamagnificens, or frigate bird. As the birds possess a marked preference for the northwest lagoon, Barbuda's seemingly endless white and pink sand beaches are left to the peaceful wanderings of those lucky enough to sojourn here. Activities on Barbuda are appropriately relaxed, including beachcombing (on the northeastern Atlantic coast), fishing and hunting and, at the island's resorts, golf, tennis, snorkeling, diving, or simply soaking up the sun and the calm. Points of interest include the Frigate Bird Sanctuary, the truly noteworthy pink and white sand beaches, and an abundance of shipwrecks and beautiful reefs. Barbuda can be reached easily from Antigua, either by air (a 20-minute flight, twice daily) or by boat (in three hours). The island is home to the luxurious K-Club, Coco Point Lodge and Hotel Palmetto resorts, as well as to a number of other hotels and comfortable guest houses. Barbuda's history has been intimately tied to that of Antigua for centuries. The first early attempts to settle Barbuda (by both the British and French) were failures, and it wasn't until 1666 that the British established a colony strong enough to survive the ravages of both nature and the Caribs. In 1680, four years before he began cultivating sugar on Antigua, Christopher Codrington was granted (with his brother John) a lease to land in Barbuda. With subsequent leases that granted them additional rights to the substantial wreckage along Barbuda's reefs, they became the island's preeminent family. For much of the eighteenth century the Codrington land on Barbuda was used to produce food and to supply additional slave labour for the Codrington sugar plantations on Antigua, and so the Barbuda's fortunes rose and fell with those of its larger neighbour. Testament to the influence of the Codringtons remains today, both in the island's place names and in its architectural remains. On Barbuda's highest point (124 feet) are the ruins of the Codrington estate, Highland House, and on the island's south coast still sits the 56-foot high Martello castle and tower, a fortress that was used both for defense and as a vantage from which to spot valuable shipwrecks on the outlying reefs.